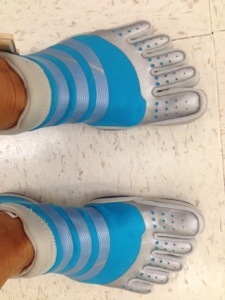 I’ve heard that the toe shoes are supposed to be really good for your feet if you are a runner. I think they are the funniest looking shoe around. They had some at Marshall’s so I decided to try some on. They are pretty comfortable, so I went ahead and bought them. I exercise so early that no one will ever see them if I decide I like them. The best part of getting them was when my two year old nephew saw them on my feet. He pointed and just started laughing. It was so funny. It made buying them worthwhile. He made me take them off and when I sat on the couch he came from behind and threw them over and shouted, “ta da!! !” I tried to put them on his feet but he wanted nothing to do with them! It was all pretty amusing and I’m glad I bought them. Can you wear flip flops!? Those are the ugliest things I’ve ever seen. 🙂 I’m so glad at will be dark when you wear them. I wish you would have gotten all that on video!! I put them on to go walk tonight, but I chickened out. I’ll try them in the morning!